Digital Storm's first entry into the "Steam Machine" category isn't messing around. PC manufacturer Digital Storm unveiled its first Steam Machine today, and it's a doozy. 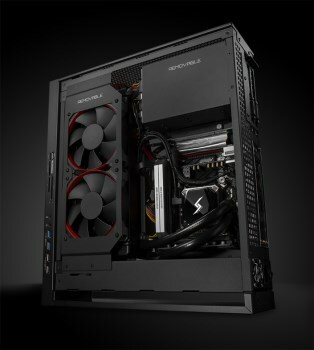 The Bolt II will boast liquid-cooled, factory-overclocked CPUs, high-end dedicated GPUs, removable brackets for easy upgrading and an "expertly engineered airflow design," all in a small form factor enclosure. It will ship with both Windows and Steam OS installed. In case there's any question, this rig will not come cheap: It will be available in four customizable configurations that start - start - at $1899.00. "We (Digital Storm) are not looking to compete with console pricing," said Digital Storm Director of Product Development Rajeev Kuruppu. "We're taking aim at the high end of the market, targeting consumers that demand the best possible gaming experience and who are looking for a PC capable of playing any title on their new 4K display." It's not the sort of thing you're likely to buy to play Minecraft, in other words, but with at least a dozen other manufacturers teaming up with Valve to build Steam Machines - Alienware, Falcon Northwest, iBuyPower, CyberPowerPC, Origin PC, Gigabyte, Materiel.net, Webhallen, Alternate, Next, Zotac and Scan Computers were all revealed today as partners on the project - consumers who don't have two large to blow on living room gaming will probably have at least a few more budget-conscious options to choose from. Digital Storm's Bolt II will go on sale at the end of January. UPDATE: Now with specs! Digital Storm was kind enough to provide us with some details and, well... wow. Hold on to your hats. All that gaming hotness will set you back a whopping $2,584. Yowzah!